Max Biaggi won the opening race to the 2012 World Superbike Championship while defending champion Carlos Checa came back from a high-speed crash in the first race to win the second at Australia’s Phillip Island circuit. 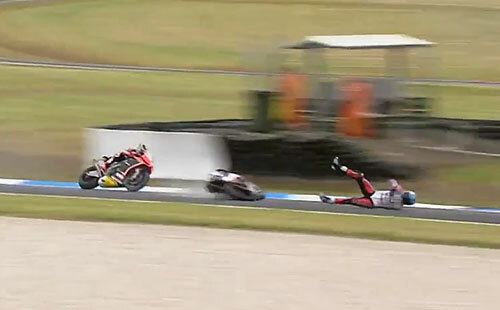 Reigning champion Checa of Althea Ducati had a stunning high-side crash while leading on the sixth lap of Race One. 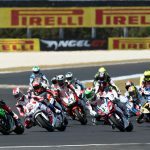 The WSBK paddock was already in shock with the death of 17-year-old Oscar McIntyre in the Superstock 600 race the day before but thankfully Checa was not seriously injured. The crash however allowed the 2010 champion, Aprilia Alitalia’s Biaggi to take over the lead. Biaggi would lead the rest of the way for the season-opening win. Finishing second was Marco Melandri in his first race with the BMW factory team, who edged out Effenbert Liberty Ducati rider Sylvain Guintoli by 0.274 seconds. Also noteworthy was Tom Sykes on the factory Kawasaki ZX-10R who started on the pole and led the first two laps before finishing fourth. Race Two began in similar form to the first race with Sykes jumping into the lead with Biaggi on his tale. This time however, Biaggi ran wide into the first corner and ran off track. The error dropped him to last place but the Roman Emperor was able to re-join the race. While Checa battled Sykes and Honda’s Jonathan Rea for the lead, Biaggi mounted a comeback. After finishing the first lap in 24th place, Biaggi worked his way back into contention. By Lap 11, Biaggi was up to sixth place and by Lap 13 he began his challenge for a podium finish. Biaggi passed Sykes on Lap 18 to move into third and on the following lap passed Rea for second place. Checa was out of reach but Biaggi crossed the finish just under six seconds behind the winner. Meanwhile, Rea and Sykes fought for the final podium spot with Sykes overtaking Rea and his fading tires on the final lap to secure third place by 0.134 seconds. 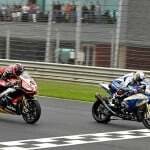 The 2012 WSBK Championship continues April 1 at Italy’s Imola circuit. Biaggi holds the championship lead at 45 points followed by Melandri at 30 and Sykes third with 29. With his Race Two win, Checa sits fourth at 25 points.